Had the privilege of building and riding the new Greenspeed Magnum. What a cool trike! Rode the “Mag” for about 15 miles and, as with all Greenspeeds, nothing but smiles, tight turns and smooth handling at speed. Most immediately impressive — because it’s unusual — are the three 20″ x 2.35″ Schwalbe BIG Apple tires. Results in a wonderful fast smooth shock-absorbin’ ride. Also kind of neat to see a GS w/ 20″ wheels in front instead of 16’s. Still has that great Greenspeed cornering though and good front-to-rear and side-to-side stability. 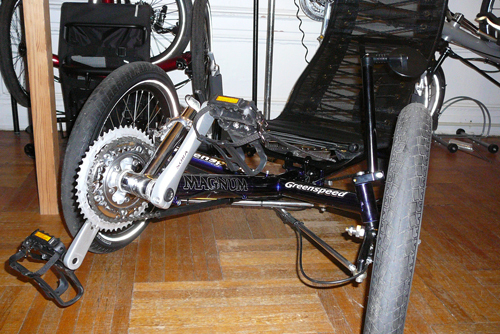 By my measurements, has 28″ track (width at the front wheels), 42 1/2″ wheelbase and 13″ seat height at lowest setting. So, this is a large trike. Has drum brakes, as usual for GS (love them). And, of course, it has high quality indirect steering. Seat is height adjustable. Now THAT’S cool! 13″ is lowest. Can be raised another 2″ – 2 1/2″. So this is could be a great trike in traffic. Seat back is angle adjustable, so you get a very versatile machine. Get this: the front wheel axles have single push button releases. Wheels can be removed with a single button, so…seat comes off, wheels come off, bike folds up in a tiny package…all in about 30 seconds if you’re taking your time. The production version of the axle will probably be even more refined. This is a prototype and components will probably change for the production model, so no point mentioning specs and weight. Anticipate good specs though and a price in the mid-2K’s. The ChroMo prototype here, colored dark glossy purple with chrome boom and steering rods, reminds me of a Harley Davidson — I kid you not — especially with these massive 20×2.35″ tires. I like what they’re doing here. Will be interesting to see what colors they settle on. But purple and chrome is good. 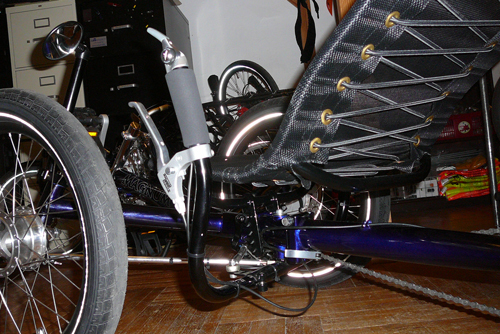 The height adjustable seat makes this a particularly good trike for riders who are mobility impaired. I also think it’s a neat extension of the Greenspeed line, like they’re adding to their classically nimble and fast trikes with a more “every dude” model.